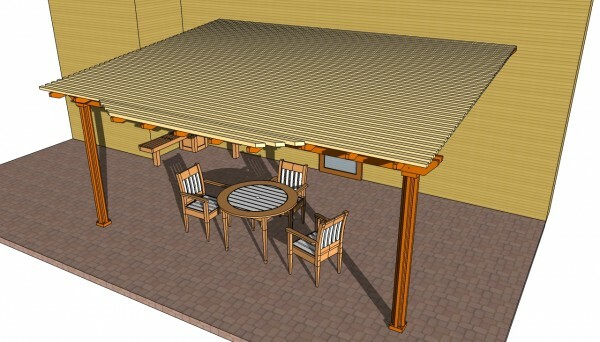 Step by step woodworking project about attached pergola plans. 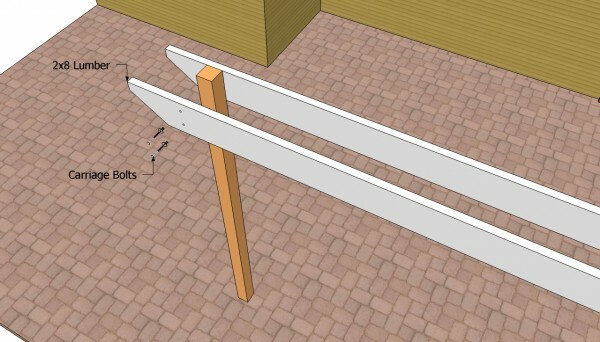 In this article we show you how to build a pergola attached to the house, as well as the tools and materials required for the job. 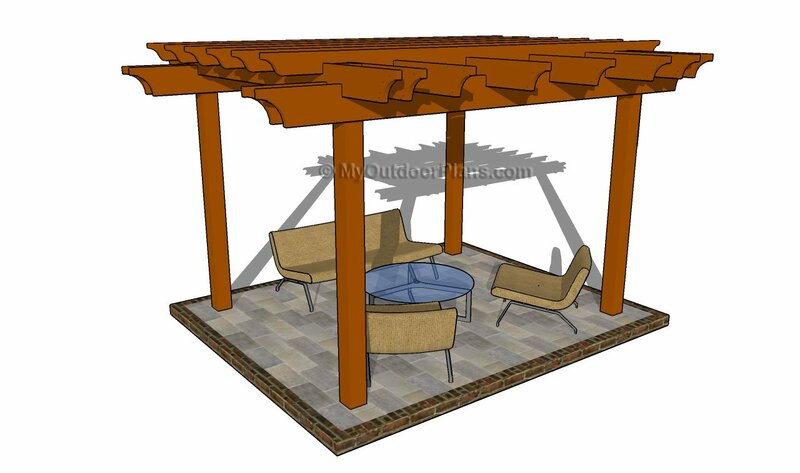 Before starting the project, we recommend you to design the shape an size of your pergola, as to fit your needs and tastes. There are many designs to choose from, therefore you should study all the alternatives before building the project. We recommend you to involve your family in this preliminary stage, as their creative ideas could add value to your project. 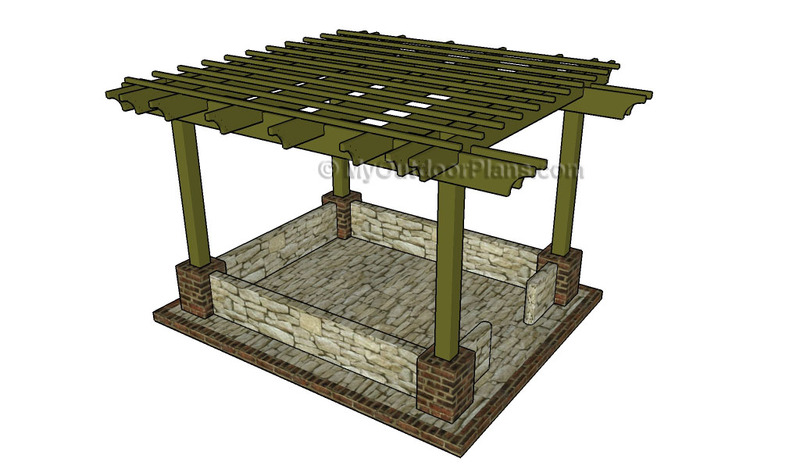 After you have made a thorough sketch of the pergola you should jot down a list with all the materials required for your woodworking project. Afterwards, you should go to several lumberyards and ask an estimate. In order to obtain a proper result, we recommend you to buy lumber designed for outdoor use, such as cedar, redwood, pine or pressure treated. After assessing the quality of the lumber and its price, you should choose the best offer for your budget. 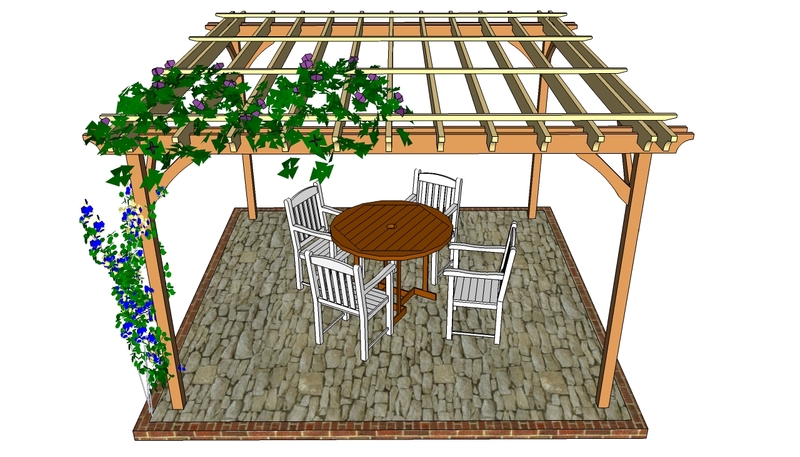 Top Tip: In order to enhance the look of the attached pergola, we recommend you to add 2×2 trims to the wooden posts. In addition, the 2×2 shade elements would add a dramatic look to your project, as well as the small slope of the roof. Before beginning the actual work, you have to decide the anchoring system of the wooden posts. On one hand, you could dig 2-3′ deep holes in the ground, install tube forms and pour concrete footing. 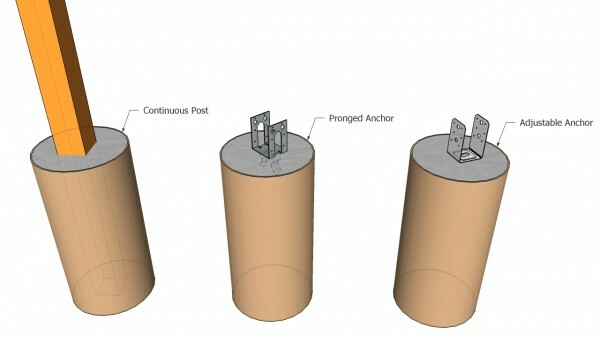 Insert the posts into concrete and anchor it with metal hardware. On the other hand, you could install the posts to a concrete slab or patio, by using metal anchors and appropriate screws. Next, you have to cut the wooden posts at the proper size for your needs and install them into place, in a professional manner. Before driving in 3” lag screws, we recommend you to plumb the posts with a spirit level and to lock them into place with two braces and several C-clamps. Top Tip: There is no standard size for a pergola attached to the house, therefore you should adjust its dimensions according to your needs. After installing the front posts into place, you have to fit the support beams. 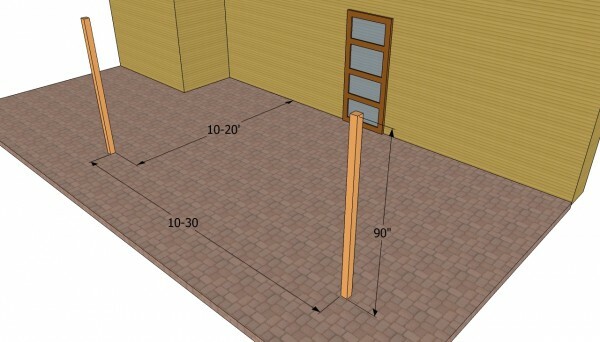 In order to obtain a proper result, we recommend you to build both beams from 2×8 lumber. Cut the lumber at the right size, align it properly with a spirit level and lock it with several C-clamps. Top Tip: Drill pilot holes in the beams and trough the posts, before inserting the 7” carriage bolts, in order to prevent the wood from splitting. Afterwards, you have to fit the ledger to the house, as in the plans. In most of the cases, the ledger should have the same size and dimension as the support beams. Align the ledger at both sides and drill pilot holes in the lumber, before inserting the lag screws. 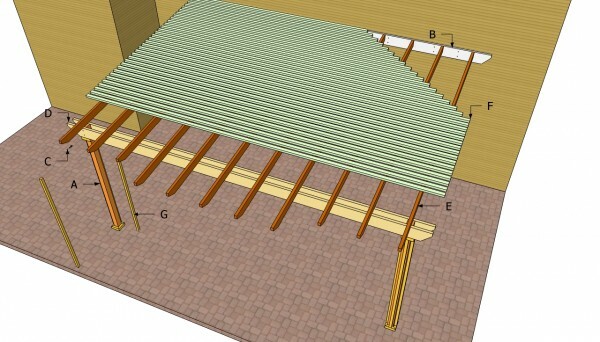 Top Tip: If you want to build a pergola with a sloped roof, you should install the 2×8 ledger at a higher distance from the ground, according to tastes and needs. 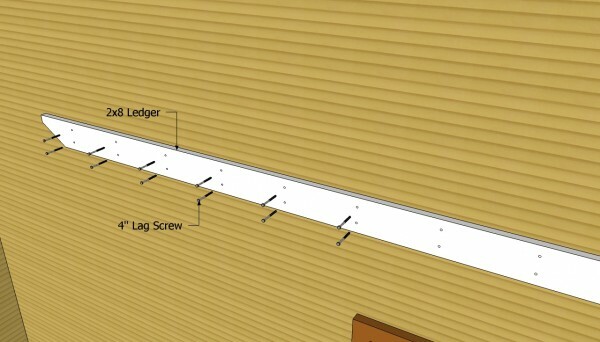 When installing the ledger to the house, you should pay special attention to the house. 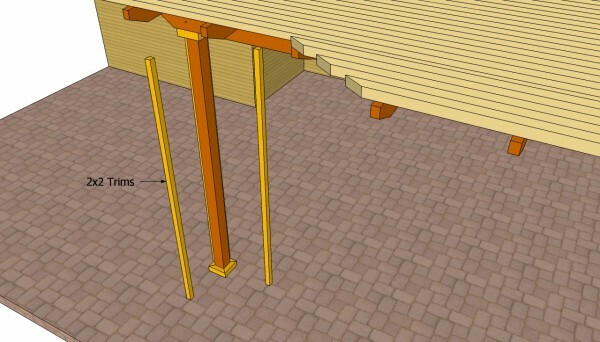 As you can see in the pergola attached to the house plans, you have to waterproof the connection between the ledger and the house, using a two-piece flashing. Top Tip: In order to lock the wooden crossbeams properly, we recommend you to install a 2×2 component at the bottom of the ledger, using 3” screws, every 10”. Continue the woodworking project by installing the crossbeams to the ledger. As you can see in the image, you have to place the 2×6 components equally spaced (every 16-24”), in order to obtain a neat appearance. 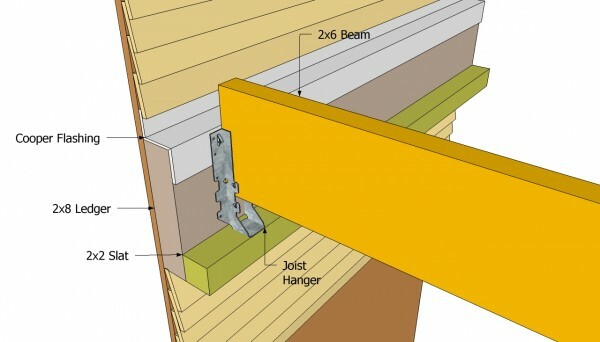 Top Tip: Toe-nail the crossbeams to the support elements, as well as to the ledger. Work with great care and attention, in order to obtain a professional result. Next, you have to fit the 2×2 shading elements into place. Cut the components at the right size and lock them into place, by driving in decking screws at both ends. Don’t forget to pre-drill holes in the slats, before inserting the 3” screws. 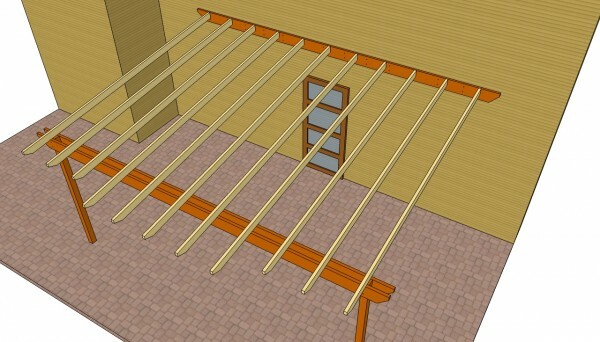 As you can see in the image, you could make your pergola unique by installing the v-shaped slats in the front. 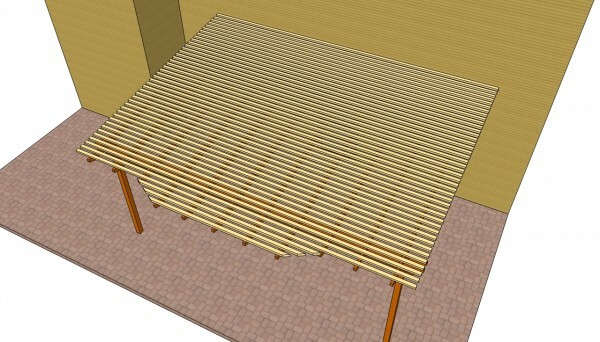 Place the slats equally spaced, using a 2” piece of wood between the slats. After you have installed the shade elements into place, you should get the job done by fitting 2×2 trims to the wooden posts. Work with great care and attention, if you want to obtain a neat appearance. Top Tip: If you secure the trims with screws, you should countersink their heads. Otherwise, you could use wire nails and cover their heads with wood putty. Before applying several coats of wood stain or paint, you have to fill the holes, the gaps and the cracks with wood putty. Don’t forget to let the compound to dry out, before sanding the surface with 120-grit sandpaper, using a sander. Top Tip: Clean the surface with a dry cloth thoroughly. Afterwards, you should protect the wood from water damage and decay, by applying several coats of stain or paint. Thank you. Good luck. I’m looking forward to seeing your projects.